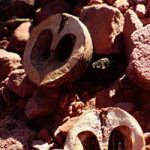 The heartnut or Japanese walnut is a medium sized tree, growing some 25 cm per year, which bears large numbers of heart-shaped nuts. These are edible raw or cooked with a good walnut flavour, and the oil from them is also edible. Esteemed, with many cultivars in Japan and North America. These seedlings should inherit many of their parents characteristics . Trees need less attention than walnuts, give full sun and a well drained soil; hardy to about -25°C. Plant 2 selections for cross pollination. Plants are grafted or seedling trees from known mothers, 20-50 cm high. Note that seedling trees will not be identical to the mother tree so there may be variation in the nut shape and size.